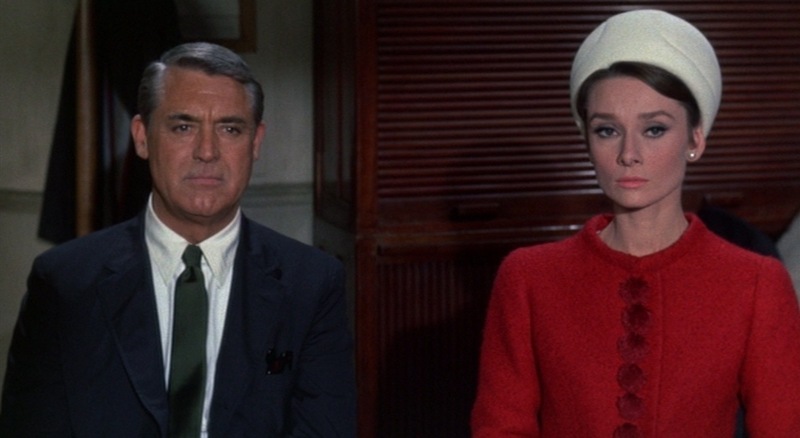 Unlike his previous prominent foray into espionage cinema, Charade provides Cary Grant with multiple wardrobe changes and the chance for the actor—then pushing 60 years old—to showcase his ability to easily outdress actors half his age. 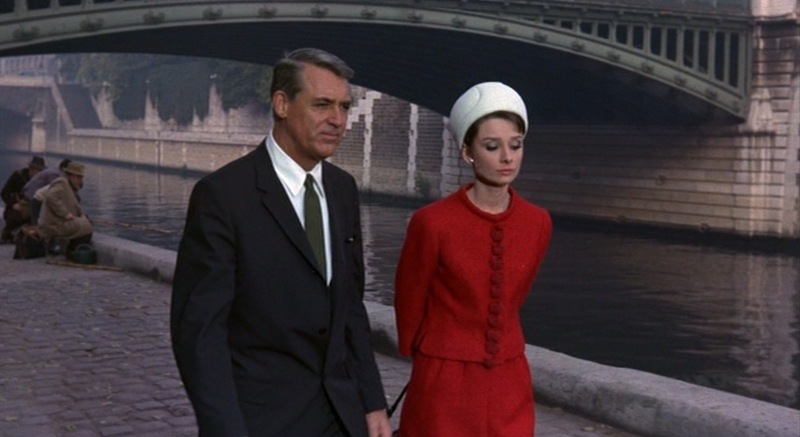 Grant’s most frequently worn suit in Charade is a dark navy blue suit, featured in many of the film’s signature scenes from the orange tamoure dance to the climactic chase through Paris. One sequence finds Grant’s character walking with Reggie along the Seine, enjoying ice cream, when she spills some of the confection on the suit. Grant brags that the suit is “drip-dry” and proceeds to show her as much by wearing it into the shower… thus foiling her plans to search it for clues to his identity. BAMF Style reader Shaiaz Shah deducted from Grant’s “drip dry” comments that this dark navy two-piece suit is likely the Haspel “Exemplar” suit in a then-groundbreaking polyester/rayon “wash-and-wear” blend. Haspel seems to support this theory on their site. Cary Grant often wears this suit jacket with just the lowest one or two of the three buttons fastened. This isn’t recommended for most men, but it works with Grant’s frame and also has a practical purpose within the film; as Grant’s character wears his gun on his right hip, his weapon remains concealed under the closed jacket but the lower buttoning point allows him a large enough opening to draw it if needed. Grant also wears the jacket with just the bottom button fastened. Because what are you gonna do about it, tell Cary Grant how to wear a suit? Grant’s suit jacket has a single back vent, two-button cuffs, straight flapped hip pockets, and a welted breast pocket where he keeps his eyeglasses. Cary Grant’s eyeglasses spend about 99% of the film in his pocket, 0.5% of the film on his face, and 0.5% of the film being wiped off. The high rise trousers are flat front with plain-hemmed bottoms, worn with a black nylon belt. 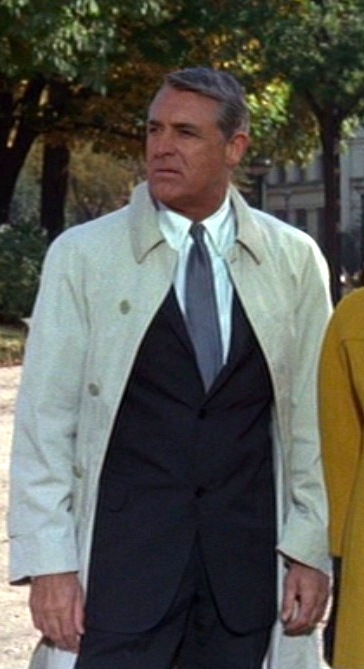 The dark navy blue suit is first introduced when Grant arrives at the home of Hepburn’s character, Regina “Reggie” Lampert, as she is mourning her husband (and her possessions). He pairs the suit with a pale blue shirt and a French blue silk tie. 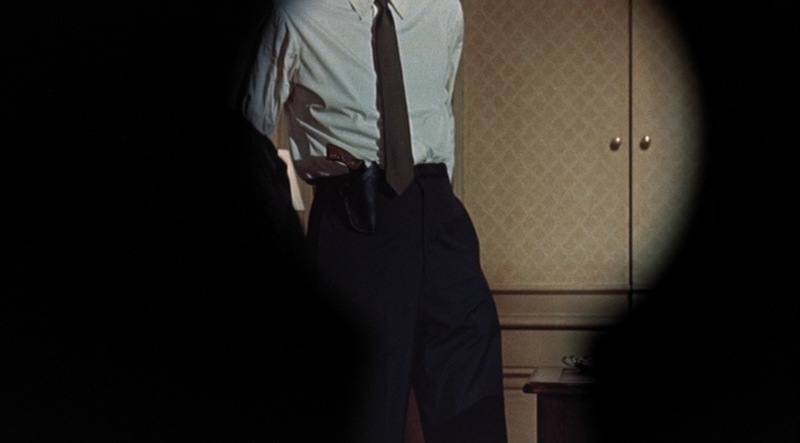 For the rest of the film, Grant sticks with plain white cotton shirts, all styled similarly with point collars and wide front plackets. 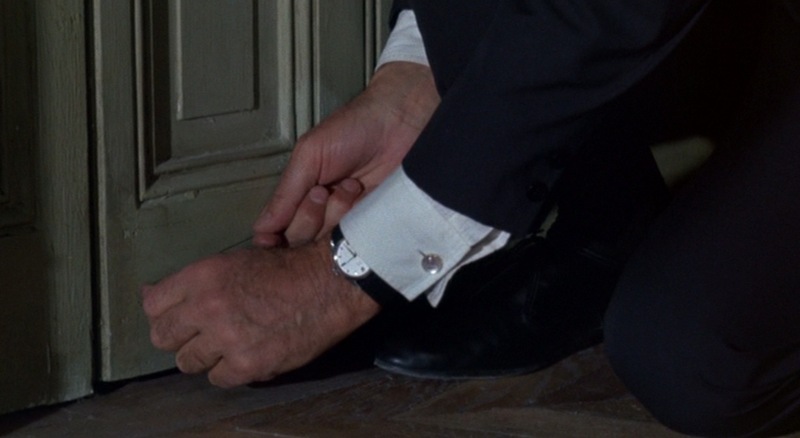 Grant’s shirt sleeves are finished with single cuffs, rather than the traditional double (French) cuffs, which are lighter-wearing and can be less cumbersome, particularly for a man of action like the snubnose-carrying spy that he is. His cuffs are dressed with plain, round mother-of-pearl links. Under the left cuff, Grant wears a plain and sensible wristwatch with a round steel case, white dial with a marker at each hour, and a simple black leather strap. Apparently, it’s 3:30? Either their date went very late or it gets dark early in Paris. Finally, Grant suits up for the film’s climax in the dark navy blue suit, white shirt, and same French blue necktie worn earlier. Possibly expecting rain or moments of badassery, Grant pairs the ensemble with an ivory knee-length Aquascutum raincoat. The coat is single-breasted with 5 light brown buttons. The raglan sleeves fasten at each cuff with a single smaller button on a half-tab. The back has a single vent and a storm flap across the top. Remember this the next time you’re thinking, “It might rain today. I should wear a bright yellow parka.” No, you shouldn’t. On his first date with Reggie—which takes them to the orange tamoure dance scene—Grant wears the suit with a white shirt and solid forest green tie. Grant is next seen wearing the suit on a dinner date with Reggie on a boat traveling down the Seine (try and top that, Mr. I-Got-Us-Reservations-At-Chili’s). For this, he wears a white shirt and a solid navy tie. Grant manages to create a variety of good looks using only three ties and two shirts. All of Grant’s ties are of a conservative width, getting slightly wider towards the bottom. With the green tie, Grant wears a gold tie pin that keeps it in place. The tie pin serves a secondary purpose; he uses it to rig a device to booby trap Reggie’s hotel room door after their date. Best seen when rigging Reggie’s door, Grant wears a pair of black leather two-eyelet derbies with a long plain toe. He wears thin dark navy dress socks. 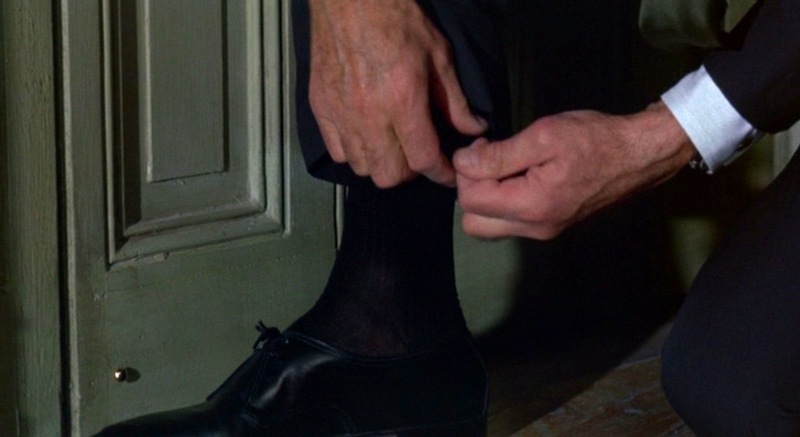 Probably the best view any movie has ever provided of Cary Grant’s socks. Grant’s character wears his revolver in a right side hip holster. The holster itself is only seen clearly once, when Grant removes his jacket after a long night of orange-transferring and bad guy-chasing. Grant doesn’t get much time to get any on-screen drinking done, replacing his martini with a revolver. However, he does enjoy a highball in a Parisian nightclub before the action takes off and is also shown to enjoy skiing. So check those off of your list of things to appreciate (or look like you appreciate) in your lifelong quest to be like Cary Grant. 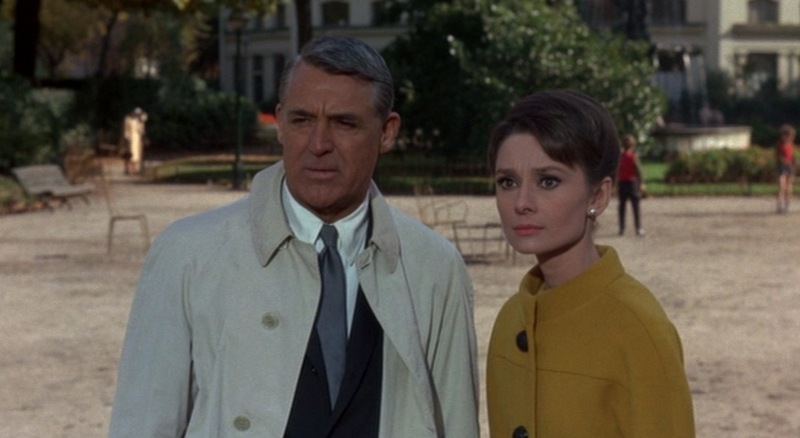 In Charade, Cary Grant shows how to diversify a simple wardrobe to fit the moment, wearing the same suit on a date, a meeting, and a chase through the streets and subways of Paris. As usual, you can buy all of these things but just keep in mind that Cary Grant will still look better than you. 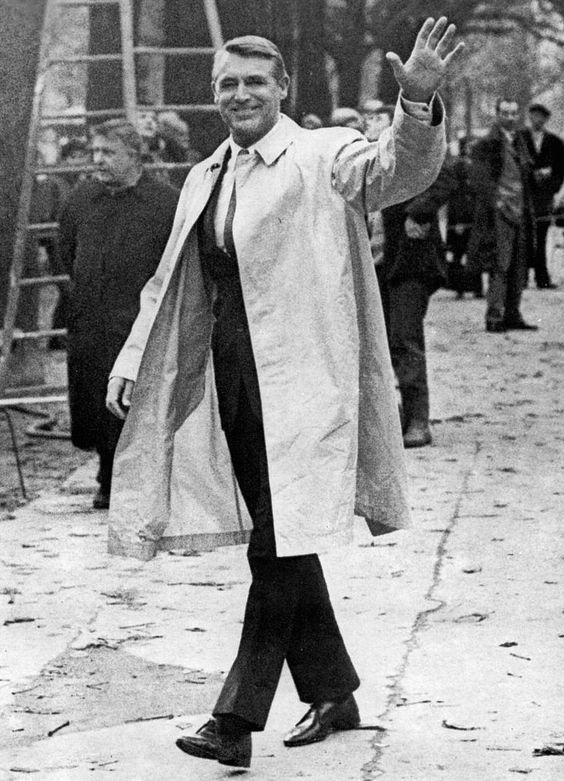 Unusual for Cary Grant, his character carries and uses a gun throughout the film. The gun in question is a snubnose Smith & Wesson Model 10. The Model 10 was one of Smith & Wesson’s most popular handgun designs, having been around in various models since its introduction in 1899 as the “Military & Police Hand Ejector”. It introduced the venerable .38 Special cartridge to the firearms world and quickly shot to popularity among both police and criminals. 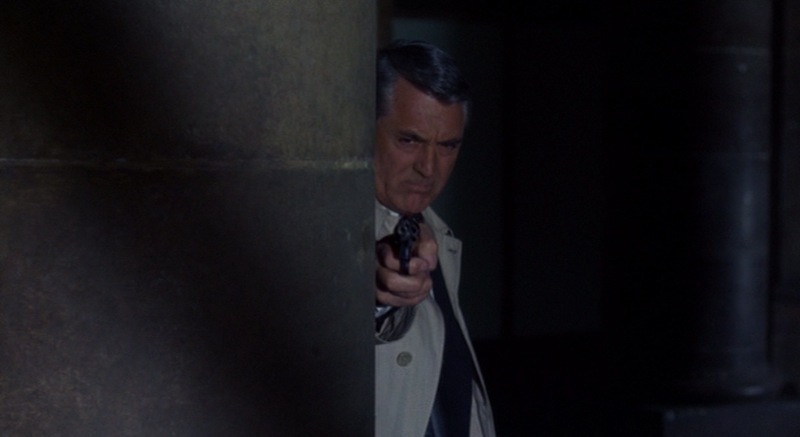 The snubnose Model 10 is an appropriate choice for Grant’s character, an American government agent who requires a concealed weapon just in case of an incident. He’s not James Bond, going out and getting into gunfights, but it’s good that he has something reliable and powerful at hand if he needs it. The Smith & Wesson Model 10: Because you never know when Walter Matthau will be lurking about. The Model 10 is differentiated from the Model 36, the .38 snubbie used by Ray Liotta in Goodfellas as well as countless other film characters, as the Model 10 is a full-size 6-round revolver whereas the Model 36 only carries 5 rounds. Check out the Criterion Collection version of the movie. Since it’s in public domain due a Universal Pictures error back in the ’60s, many companies have released versions of varying quality. Only Criterion has issued a version clear enough to satisfy. Adam Canfield (since it’s his name in this scene): We didn’t steal it, there’s no law against stealing stolen money. Regina “Reggie” Lampert: Of course there is! Adam: When did they pass such a silly law? No arguing with Grant’s logic. Fantastic post! Thanks…One of my favs! Not as sharp as he once was in this picture but still a cut above the rest don’t you think? Definitely! Still manages to look classier than most folks these days, though. Thanks for reading! I can’t say I agree with it being black, even “soft black” (which would merely be a dark shade of charcoal). It still looks dark navy or midnight blue to me. Cary Grant was not known for wearing black suits, even when his persona style declined a bit with age. He was an old school dresser. Black suits don’t figure into the Anglo-American menswear tradition. I wouldn’t wear a black suit unless it’s a tuxedo (even then midnight blue is preferable) or a The Matrix/Reservoir Dogs cosplay. The reason being that there are always better options with more versatility in what shirts, ties, shoes, and other accoutrements can be worn with them and look good. Many of my early posts have me cringing at my lack of knowledge. It’s remarkable how much I’ve learned in two years just by screencapping, writing, and getting feedback from guys in the know like you. When I first started, I had no idea – though I should have guessed – about the relative uselessness of a black suit. With this knowledge, and much else learned, I still need to revisit some older posts and add a new layer of “enlightenment”. One of the more egregious errors that I couldn’t help but to correct expediently: not quite grasping the difference between a blazer and a sport coat. I will need to correct the Charade post as well as a few other ones. I think that one was written insecurely because it was one of my first “requests”, and I was eager to please. Thanks for your input; I appreciate it much more than just saying “it’s blue, not black dummy”. I try to never say things like that. That is, unless someone isn’t receptive to learning at all and insists on their mistakes! It also just dawned on me that two suits may have been used, since it looks charcoal in some screencaps and navy in others. But the only way to confirm that would be to get a behind the scenes confirmation. Cary Grant himself said, “Don’t be a snob about the way you dress. Snobbery is only a point in time. Be tolerant and helpful to the other fellow — he is yourself yesterday.” It’s my Ask Andy Forums signature for a reason. God I want to bang Audrey Hepburn! Eew, that would be necrophilia. Hi , just want to say that l am a big fan of your blog , sir. 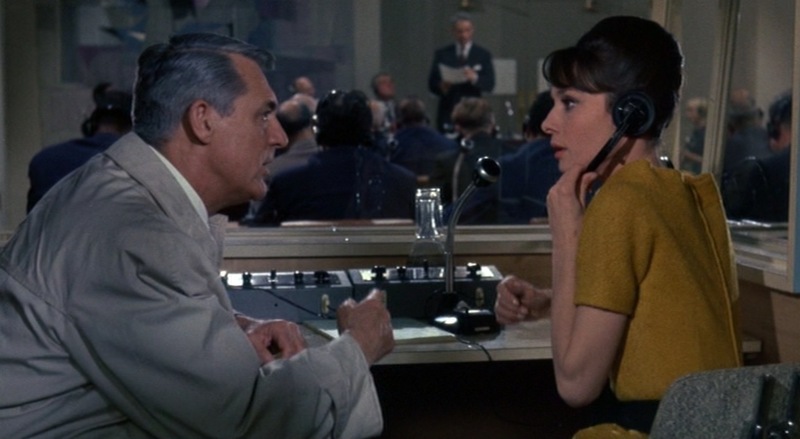 I do believe that Haspel made Cary Grant’s Suit in “Charade ” if l am not mistaken. 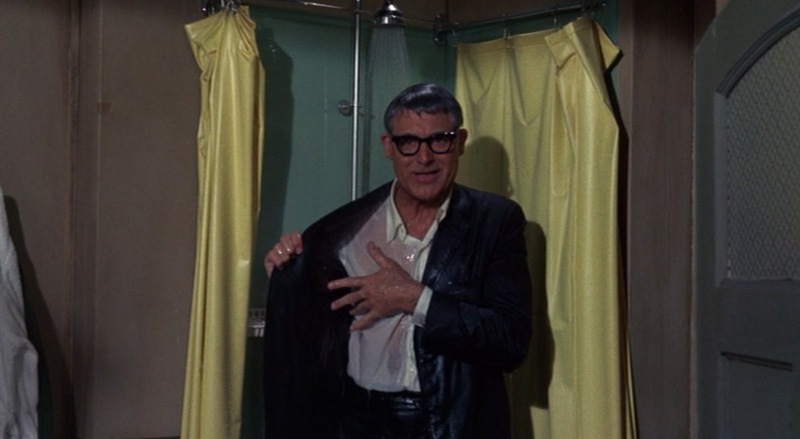 There is a scene when Grant comments that the suit is a ” Drip Dry “. In the 1960s , Haspel used to produce a Suit called Exemplar ” Drip Dry “. The suit is ( or was ) unique because it was one of the only suits that you could wash and wear like one would , a shirt. 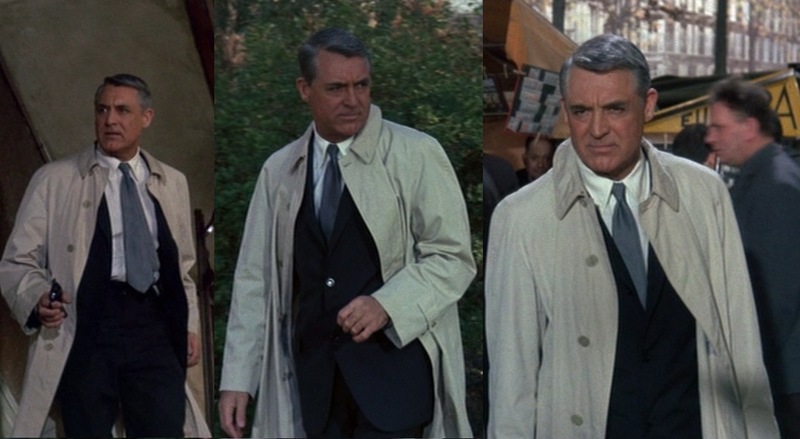 The suit is made from Polyester and Rayon , which is typically not fabrics which one would associate with Cary Grant ( I always imagined he dressed in natural fabric suits like Worsted wool , linen or dupioni silk ). What do you think ? 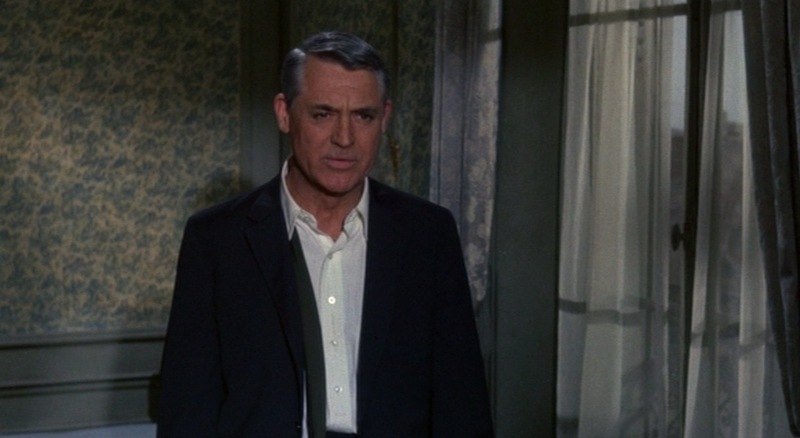 Great style, great job you’ve made on Cary Grant again. Congratulations ! I’m french, so excuse me for my poor English. But I disagree with you on just one thing. It’s not the Smith & Wesson Model 10 (snub nose version) we can see in this picture… It’s visible by the grip and the barrel. Actually it’s a Colt Detective Special, also a .38 caliber. The Detective Special was largely used by civilian police forces (we can se it in many many pictures, like “The Detective”, “Madigan”, “Harper”, and a large part of classics Noirs of 40’s and 50’s) and FBI forces (but just during investigations or to supply a first heavyer service weapon). The Smith & Wesson Model 10 was largely used by polices forces in uniforms during 40’s, 50’s, 60’s and 70’s, in huge cities like New York, Los Angeles or San Francisco. In the classic version (3 or 4 inches barrel). The snub nose version was much lesser visible in pictures, but we can see it in “McQ” directed by John Sturges, with John Wayne (1974). In fact, in this particular picture, it’s also the snub nose version with heavy barrel (the best graphic version of this gun). The explanation about Grant buttoning only the bottom button of his jacket to get quick access to his gun doesn’t really add up. You can see he wears it on his right hip, which means, were he right-handed buttoning the bottom button only restricts access – better to have only the middle one buttoned. Were he left-handed it still makes no sense as when reaching for it he would somehow have to pull it out, not by the grip, which is facing away from him like a cowboy, but by the trigger barrel grip then turn it around to fire. CG has been my style model for 50 years but I have never been able to get past his occassional odd habit of buttoning jackets the wrong way. 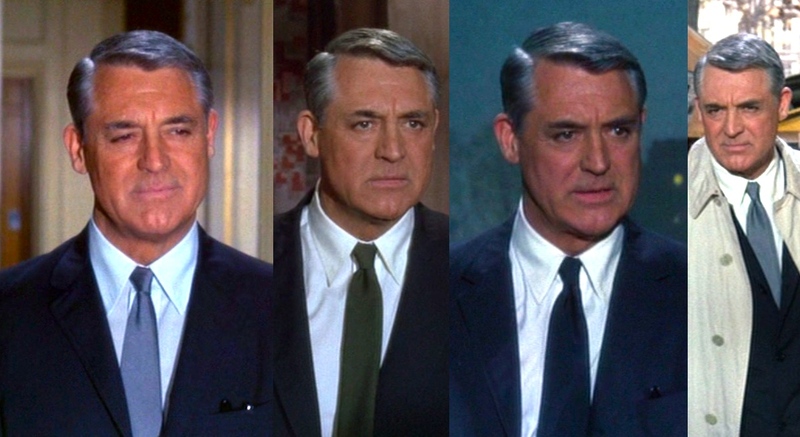 Indiscreet in colour I think is the best movie portraying his mastery of an array of solids…about seven in all…suits, shirts and ties. It’s his brilliant manipulation of solids which contributes much to his unique place in the world of style.